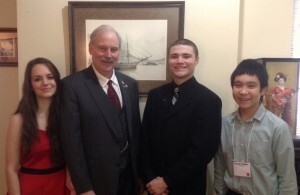 Senator Stedman had the privilege of meeting with several students from the Alaska Youth for Environmental Action (AYEA) program. According to the website, the AYEA program was created by the Alaska Center for the Environment to inspire and train rural and urban youth leaders to impact environmental issues by providing leadership skills training and youth-led community action projects. Every year, the youth have the opportunity to participate in the Civics & Conservation Summit during the legislative session. They travel to our state capitol to watch and learn the legislative process and meet directly with the legislators regarding bills that would have an environmental impact. The AYEA students who met with Senator Stedman had the opportunity to speak directly with him regarding several different bills and topics of interest. The bills discussed were HB 1 – State Arctic Policy; HB 19 – Discrimination: Gender ID. ; Sexual Orient. ; HJR 6 – Federal Contamination of ANCSA Lands; and HB – 58 Eligibility for AK Energy Effici Loans. They ended the conversation with discussion on decupling of oil and gas, climate change, and electric carbons. Senator Stedman was happy to be able to sit down with these future leaders from across the state to discuss important issues. The Region V basketball tournaments are final. All of the teams showed tremendous courage in battling for a seat at the state tournament in Anchorage next week. Senator Stedman congratulates the champions and runner-up teams throughout the region and wishes them the best of luck at the state tournament. A special congratulations to the students throughout the district who made the All-Academic team as well as those who received the Sportsmanship Award. “Both Ketchikan boys and girls teams fought to win the southeast titles over the archrival Juneau teams, both Sitka boys and girls teams won titles at the 3A level, and both Metlakatla boys and girls won the 2A titles. Congratulations to the 1A teams who will be representing our smaller communities at the state level. Hard work and never giving up paid off for them,” said Senator Stedman. Senator Stedman announced today the hire of Melissa Kookesh as his new Committee Aide. Melissa Kookesh is of the Tlingit Nation, Yeil (Raven) moiety, L’eeneidí (Dog Salmon) Clan from the Center House in Angoon, and the grandchild of the Teikweidi (Eagle Brown Bear). Her Tlingit name is X’eetoow. Melissa’s paternal grandparents are the late Matthew and Ramona (Herrera) Kookesh of Angoon. On her maternal side she is Koyukon Athabaskan and the grandchild of the late Walter and Judith Woods of Manley Hot Springs, Alaska. Her parents are Lena Woods and the late Floyd Kookesh. “Melissa is a great addition to the team. 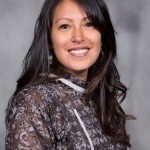 Her background and work experience for Tlingit and Haida Central Council, the largest tribe in the state, will allow her to step in, learn the system quickly, and contribute right away.” Melissa has family ties to the District, particularly in the northern end and the rural communities located there. 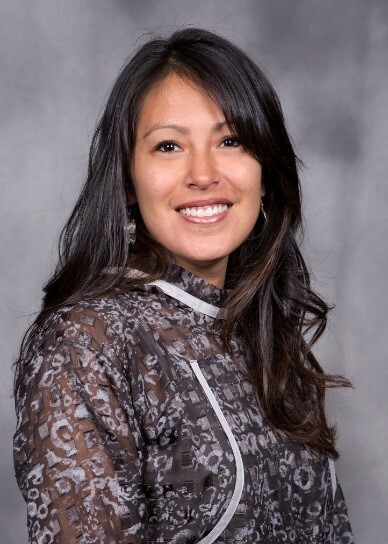 She is a graduate of Angoon High School and is currently enrolled in the University of Alaska Fairbanks and is expected to graduate this spring with her Associates Degree in Tribal Management. She and her son Tyler continue to make their home in Southeast Alaska. Please help me welcome Melissa to the office.